The summer is upon us, and that means it’s time to protect our skin from the harsh rays of the sun. I was fortunate enough to attend an educational blogger event at the Whole Foods store in Paradise Valley, where many different sun care products were featured. All natural sun care is so much better than the traditional chemical-filled stuff – eww! I learned tons at this event, including how mineral sunscreen differs from chemical sunscreen. Mineral sunscreen sits on top of your skin and doesn’t have to soak in, so it begins working immediately. (With chemical sunscreens, you have to wait 15 minutes or so for it to sink in and be effective.) Most importantly, mineral sunscreen doesn’t have chemicals soaking into your skin. Much healthier! 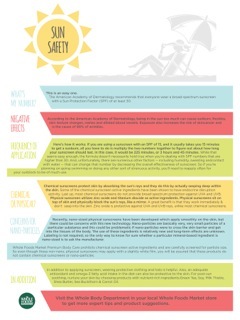 A whole list of organic-friendly suncare tips is in the pic to the left. Check it out, Scout!